Red FM has now taken up the civic issue of open urination on walls that is a common sanitation problem. Almost every street in Delhi NCR – big or small, famous or infamous – has a wall made for overflowing bladders to relieve themselves. 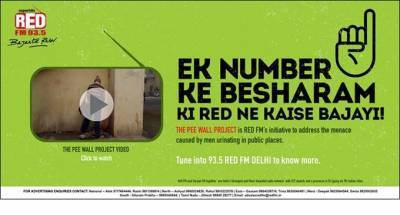 To embarrass such miscreants, Red FM put up walls of revenge termed as ‘Ek Number Walls’ – the wall that throws back water on the person who pees on the wall. Every time someone came to pee on the wall, a surprise was showered back and the wall sprays back water on them. These ‘Ek Number Walls’ are spread across different locations in Delhi NCR basis feedback from the listeners that these walls have offensive pee stench. Red FM intends to take this initiative across its key stations in the network in the coming weeks. Earlier this year, Red FM’s campaign against the menace of potholes had gained huge traction. Red FM RJ Malishka’s ‘Mumbai tula BMC var bharosa nahi ka’ song hit out at the Brihanmumbai Municipal Corporation for not being able to improve road conditions in Mumbai, especially during the monsoons. “The Right to Pleasure” explained well by Bigg Boss famed Priya Malik.